We had such a fun time celebrating my daughter's 7th birthday yesterday with a custom-designed [by me, of course] Cupcake Party!!! 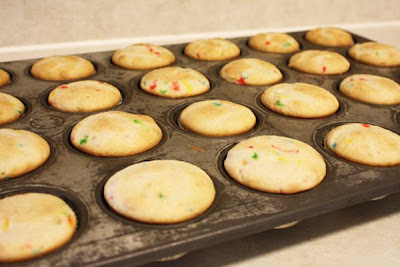 There were lots of these....I baked 8 dozen for us to eat and play with...I happened on this professional cupcake pan at an antique store and it bakes two dozen at one time...what a time saver. 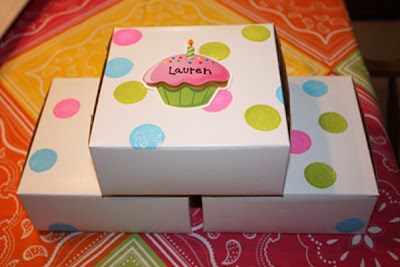 Next are the party boxes that each guest filled with their own cupcake creations. I found these for a good deal at the restaurant supply for 25/cents each. We painted each box with polka dots in pink, aqua and lime green. The cupcake name labels were found at the Dollar Tree just last week in their back to school department. 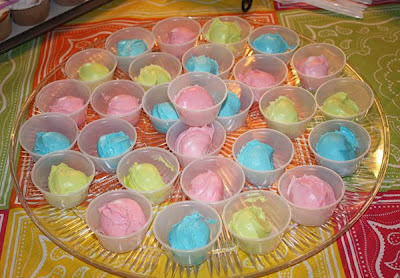 Here is how I sorted the three different frosting colors that the girls used to decorate their own cupcakes. I used some small Solo condiment cups that I found sold by the sleeve of 500 at the flea market for 50/cents. These always come in handy for craft projects to hold glue, paint and glitter. 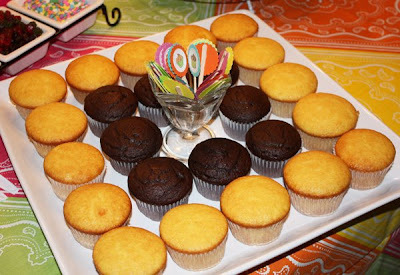 Next is more cupcakes, these in vanilla and chocolate. These are displayed on a Pampered Chef platter that I've had for many years. It comes in handy once in a while and earned its keep in my dining room hutch. In the middle are the cupcake toppers I made from a download from Lollychops website. 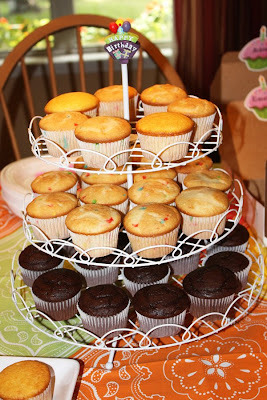 And here's a cupcake tower that a friend gave me...I've been waiting since last December to use it and I loved it on the table. I'll have to find more uses for it because it's so pretty. And that's it for now...but there's more to come....check back for Part II...tomorrow. What a great idea. This looks like such a fun time I want to have one too.